An original Kamikaze is made with simple syrup and lime juice. In our version, we switched these two ingredients for an Awa di Lamunchi. Awa di Lamunchi means water of lime in Papiamentu and is a popular local beverage on Curaçao. You can make the Awa di Lamunchi by mixing 1-liter water with the juice of 3 limes and 100 grams of sugar. So the only difference here is that the sugar doesn't get dissolved prior to using it and that it sounds much more interesting if you say Kamikaze Kòrsou. 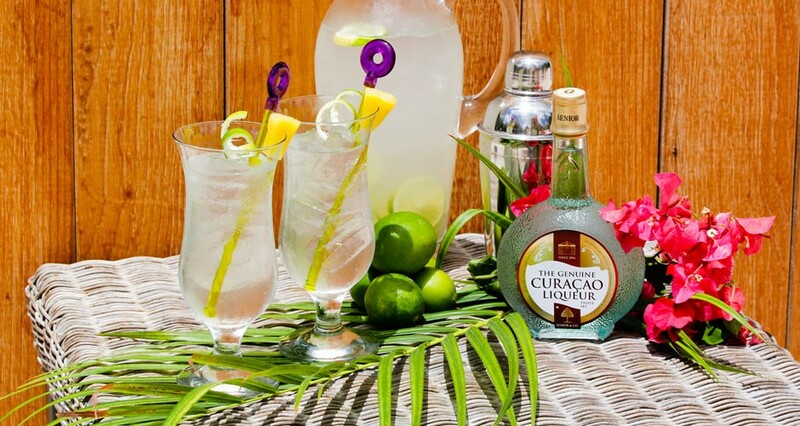 Add the Senior Curaçao Liqueur (Triple Sec) and vodka to a shaker and fill it with ice. Shake well and strain into a glass filled with ice. Top it off with Awa di Lamunchi. Use a channel knife to create a lime for the garnish and add a pineapple wedge.